Posted November 29, 2017 by Jade Morellini & filed under Bondi View. Light Rail construction taking place along the Sydney CBD, Randwick and Kingsford is having a substantial impact on smaller businesses in the area, with a large number of stores having moved out or closed down. Kensington Supermarket has been thriving for five years along Anzac Parade but now it is one of many businesses that has experienced great losses due to construction. 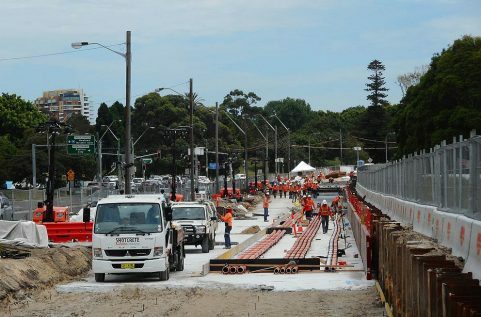 Construction for the light rail commenced in 2016 and completion is expected in 2019 as part of the $2.1 billion CBD and South East Light Rail project. The Light Rail works have caused a dramatic change for traffic conditions since the closure of Randwick’s High Street to general traffic between Clara Street and Avoca Street in March, making it much harder to access certain stores and cafes along that strip. “Construction has definitely had an impact on the traffic in Anzac Parade,” said Wendy Liu, Manager of Max Brenner Chocolate Bar at Anzac Parade. With an estimated 750 on-street parking spaces removed since construction began in Randwick shops are put in a difficult position as it means local residents and shoppers will have a hard time trying to find parking spaces. This has a flow-on effect for businesses in the area, as they could potentially lose customers who decide to go elsewhere for convenience. Under the City of Randwick Council parking recovery plan, they have identified 21 streets with enough space to create more than 400 new on-street parking spaces and they have also changed the parking time limits to better assist residents and businesses. But a lot of stores rely on foot traffic for a large proportion of their trade and with the construction sights blocking their shopfronts, it is making it much harder to draw customers in. In this zone, construction work was estimated to last until November, however it has taken longer than expected. “Small businesses on the light rail alignment who believe they have been impacted where construction has taken longer than originally expected, may request assistance from Transport for NSW to help with their rent,” a Transport for NSW spokesperson said. Rent relief will remove some of the financial pressure and compensate businesses for the losses they may be experiencing due to the Light Rail construction. A Transport for NSW spokesperson said, “Consultation is a major part of the CBD and South East Light Rail project and we regularly consult with the community, businesses and residents via information sessions, regular notifications and doorknocking. “We are committed to assisting small businesses during light rail construction and addressing any concerns that may arise. But many businesses aren’t aware of the initiatives in place by the council and state government to assist with the losses caused by construction. “Nothing has been done to help and a fair few other stores have actually moved out,” Huckins said.